With the dramatic rise of eco-Marxism in recent years, a corresponding revolution has been taking place in studies of the human-nonhuman animal relationship. Previous critical analyses with respect to the position of animals in human society have been largely dictated by animal-rights discourse, more recently represented by figures such as Peter Singer. 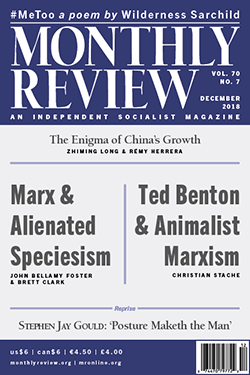 Many of these analyses contend that Karl Marx, Marxism, and historical materialism understand the human-nonhuman animal relationship through a dualist, "speciesist," or human-centric, framework—a critique most famously championed by pioneering ecosocialist Ted Benton. This issue is dedicated to analyzing the theoretical propositions underlying Marx's analysis and to demonstrate the antispeciesist and antidualist aspects of his evolutionary-materialist understanding. Please see here for reprint requests.